A borough man is behind bars after assaulting his then partner just weeks after a restraining order to protect her was lifted. 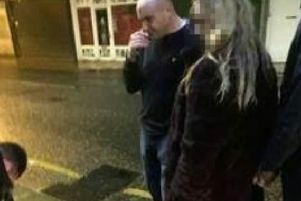 Wigan magistrates heard Christopher McClarty and Chantelle Hurst had been drinking with friend Mark Hughes on April 26. McClarty, 27, left Mr Hughes’s flat after saying he was tired, but prosecutor Katie Beattie said he returned later and started shouting at Ms Hurst, his partner of 15 months, before punching and kicking her. McClarty left the flat as did Ms Hurst shortly afterwards, but she returned and asked Mr Hughes to call the police as she had been attacked again. She suffered injuries to her face and body, the court heard. The court heard McClarty had 21 previous convictions for 39 offences, several involving Ms Hurst. His last had been for breaching the restraining order and a suspended prison sentence had been imposed. McClarty, of Boundary Street, Leigh, initially denied assault by beating, but changed his plea to guilty on the day a trial was due to start. Lina Cheung, defending, asked magistrates not to activate the suspended sentence. She said McClarty had mental health issues, was sorry for what had happened and had taken steps to stay away from alcohol. A probation officer said various agencies were working with him and a “robust package” had been put together. But magistrates felt they had no option but to jail McClarty because the assaults came so soon after the suspended sentence was imposed and restraining order removed. He was jailed for four weeks for the assault and a further four weeks for breaching the suspended jail term. JPs imposed a new restraining order preventing McClarty from going to Ms Hurst’s home in Rivington Drive, Bickershaw, for 12 months but after she pleaded to the court saying they were still friends the bench said they could keep meeting elsewhere.